The dream remains alive for a quartet of grapplers who earned the opportunity to represent the Decorah wrestling team in the postseason. Four wrestlers will continue on the quest for a state title after finishing in the top-two of their respective weight classes at the Class 2A Sectional 10 meet held in Decorah Saturday. Sophomore and No. 7 Jackson Rolfs won the 132-pound sectional title while freshman Austin Wilkins (106), junior Dawson Palmer (182) and senior Andy Murphy (195) all finished runner-up to advance to the district meet Saturday, Feb. 9, at Independence. Each will have the goal of finishing in the top-two at districts to earn a spot at the state meet. As a team, Decorah finished fourth with 149 points. New Hampton/Turkey Valley won the meet with 243.5 points. Crestwood claimed second with 228 points. North Fayette Valley was third with 181.5 points. Both New Hampton/Turkey Valley and Crestwood move on to the team regional tournament today, Tuesday, Feb. 5. There were six teams at the Sectional 10 meet. 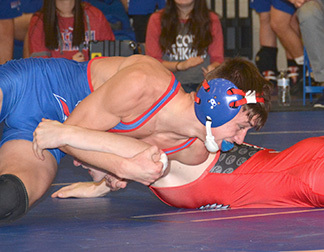 Grapplers needed to finish in the top-two of their weight bracket in order to advance to districts. Unlike other meets, wrestle backs are utilized beginning with the sectional round. Wrestle backs are used when the grapplers who finished second and third didn’t face each other. This determines the “true” second-place finisher. The quartet of grapplers representing the Vikings is largely untested in the postseason. On the mat first for Decorah to earn his district spot was 106-pound Austin Wilkins. Receiving a quarterfinal bye, the freshman threw Braeden Ellis of North Fayette Valley in 3:45 in the semifinals to advance. That put Wilkins in the finals against Class 2A No. 3 Carter Fousek of Crestwood, who proved to be a little better at the moment, threw the young Viking in 1:27. Wilkins will take a 25-16 mark into the district meet. He will face Class 2A No. 10 Lincoln Mehlert (29-10) of Union in the first round of the district meet. “Austin is wrestling the best he has all season,” pointed out Coach Freidhof. At 132 pounds, Jackson Rolfs was the only Viking to claim a sectional title. His road started with a bye in the quarterfinals. The Class 2A No. 7 Viking quickly bypassed Oelwein’s Andrew Roete with a throw in 42 seconds to slide into the finals. Rolfs dominated New Hampton/Turkey Valley’s Brayden Anderson in the finals for a 14-0 major decision win for the title. Holding on to a 32-6 season mark, Rolfs will go up against Union’s Stone Schmitz (28-12) at districts. Following a bye, Dawson Palmer (182) drew Kale Rodgers of North Fayette Valley in the semifinals. The junior survived the three-period match for a 13-6 win for a spot in the finals. There he went up against Class 2A No. 5 Evan Rosonke of New Hampton/Turkey Valley. The Viking grappler had the Chickasaw scrambling for offense throughout the match, with Palmer eventually falling 9-4. Palmer is now 27-12 for the season. He will go up against Owen Fuller (23-5) of SH-BCLUW in the first round of districts. “Dawson is the most explosive and dangerous wrestler in our room and he shows that time and time again in his matches,” noted Coach Freidhof. Making the most of his final season in a high school singlet, Andy Murphy earned a spot at districts. His sectional journey began with a quarterfinal bye before facing off with Jacob Reicks of New Hampton/Turkey Valley where Murphy won 13-6. He fell to Crestwood’s Treyton Burnikel 8-6 in the finals. In the wrestle back, the senior defeated Oelwein’s Gage Voshell, 6-3. With a 27-13 record, Murphy will face Independence’s Christian Kramer (28-15) in the first round of districts. “Andy let one slip away in the finals, but did a great job of staying composed and putting in a workman-like performance in his true wrestle back match,” said Coach Freidhof. The district meet is Saturday, Feb. 9, at noon in Independence. Champions and runners-up from the Decorah and the Aplington-Parkersburg/Grundy Center sectional sites do battle at districts. The top-two grapplers at each weight class advance to the state meet, which runs Thursday through Saturday, Feb. 14-16, at Wells Fargo Arena in Des Moines. The champion from each sectional site battles the runner-up from each opposing sectional location in the first round of district action. There will be two rounds, followed by a possible wrestle back. Wrestle backs occur if the second and third place finishers did not face each other in the first round. This determines the true second-place winner and the grapplers who advance to state. Rolfs is the only grappler with district experience after competing at 132 pounds a year ago, the seventh-ranked matman looks to punch his ticket to state Saturday.